Key Difference: Coffee and cocoa have some properties in common, but basically they are two different products. Coffee is made by combining the suitable piece of ground coffee beans and hot water. On the other hand, cocoa is a powder made from roasted, husked, and ground seeds of the cacao that is Theobroma cacao, from which much of the fat has been removed. Coffee and Cocoa are two different products. These drinks are different from the plant they are derived from, the taste, the process by which they are made and benefits they offer. Coffee nowadays is a drink of refreshment. It has become essential to life for everyone. Coffee first originated in the African country, Ethiopia. The word coffee is borrowed from the 15th century, and is a plant which is refined in mostly tropical and equatorial countries of the world, especially in the African continent. There are several types of coffee such as Latte, Cappuccino, espresso, Americano, macchiato, decaf, etc. There are various ways to make coffee, including a French press, which puts coffee beans into a press machine and infuses the flavor into hot water. Coffee puts forward benefits such as reducing risks like heart diseases, insomnia, Alzheimers, diabetes, Parkinson's disease, and dementia. It can also prevent certain, heart rhythm problems, strokes and cancers. Cocoa first originated in South America. The word Cocoa is borrowed from the 15th century, but it became popular as a chocolate in Europe by the Spaniards in the mid 17th century. Cocoa is basically produced from roasted, husked, and ground seeds of the cacao that is Theobroma cacao, which is usually known as ‘cocoa’. 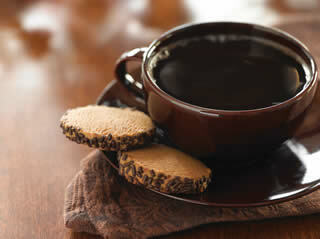 Cocoa can often also refer to the drink commonly known as hot chocolate. There are three main varieties of cocoa plant: Forastero, Criollo, and Trinitario. Cocoa is the dried and fully fermented fatty beans, of Theobroma cocoa. Many foods are prepared such as mole sauce and tejate, as they are the basis of chocolate. A coffee is prepared by combining the suitable piece of ground coffee beans and hot water. Cocoa is a powder made from roasted, husked, and ground seeds of the cacao that is Theobroma cacao, from which much of the fat has been removed. A coffee beverage is prepared by combining the suitable piece of ground coffee beans and hot water. A beverage is made by mixing cocoa powder with hot milk or water. Black, milk, vanilla, caramel, almond, hazelnut, cocoa, chocolate, mocca, honey, etc. Brown, yellowish brown, reddish brown, etc. Higher level of caffeine compared to cocoa – 40 mg.
Lower level of caffeine compared to coffee – 0.23 mg.
Can reduce risk of heart diseases, can be used to treat insomnia, reduces risk of Alzheimers, 2 diabetes, Parkinson's disease, and dementia. Prevents certain cancers, heart rhythm problems, and strokes. 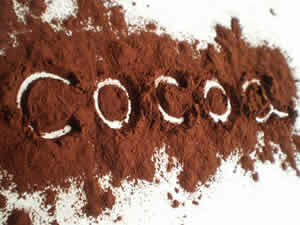 Cocoa flavonoids good for cholesterol, helps regulate blood sugar, reduce heart diseases. Can we use Coffee powder which is used for garnishing instead of chocolate powder for baking cake?